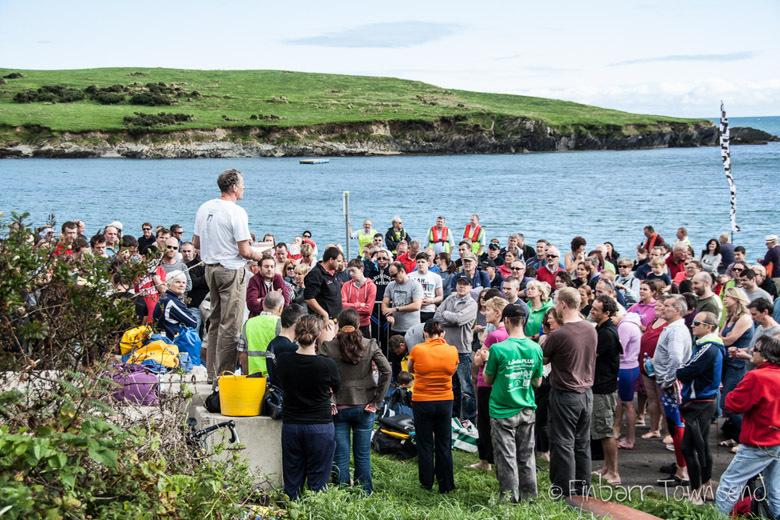 On Saturday last, September 15th, 265 swimmers took to the water for ‘The Edge Sports’ Sandycove Island Challenge 2012. Thankfully the sun shone for most of the day, and the water was calm with a pleasant temperature of about 14degrees Celsius. 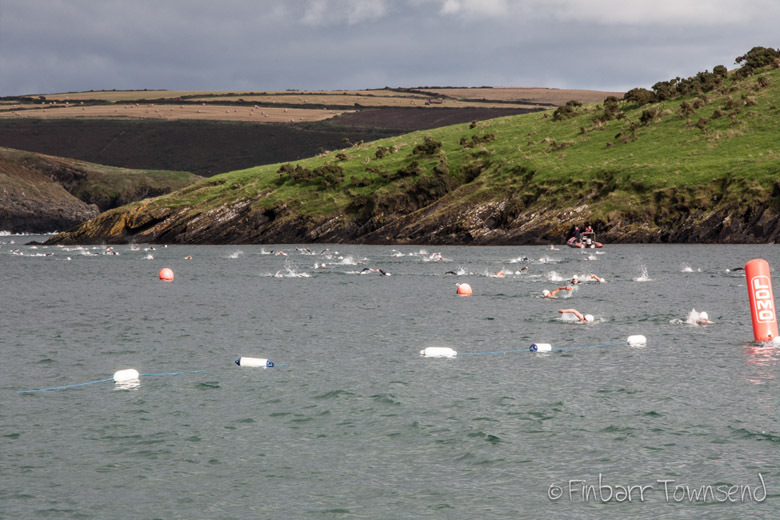 Registration began at 11am in Hamlets in Kinsale, with a steady flow of swimmers arriving until around 2:15pm. Everyone then headed across to Sandycove. At around 3:30pm we had a race briefing given by Ned Denison, who welcomed everyone to the swim and explained the necessary details to remember for the race (turn left, left, left!). At 4pm the first wave of swimmers dove in, with much jostling for first position. They were followed by nine more waves of approximately 25-30 swimmers per wave. The fastest swimmer was Dan Sweeney of Sunday’s Well Swimming Club, who completed the swim in a time of 20:53. Maeve Ryan of Dolphin Masters Swimming Club, was the first lady home in a time of 22:42. Ross Higgins and Lizzie Lee won the men’s and women’s wetsuit categories. The ‘best master swimmer’ award, which is based on the closest time to the world record in their age group, was won by Dymphna Morris from Celbridge in Co. Kildare. Also awarded on the night every year is the ‘Mike Harris Trophy’ (more about that here). This year, the trophy was very deservedly awarded to Rob Bohane, who recently completed his English Channel solo swim on his third attempt in an amazing time of 12 hours and 4 minutes. We have lots of thank-you’s to say to people. Thanks to everyone who helped out in any way in the lead-up to the swim and on the day itself, both on land and on the water. The swim could not run without all of this help. 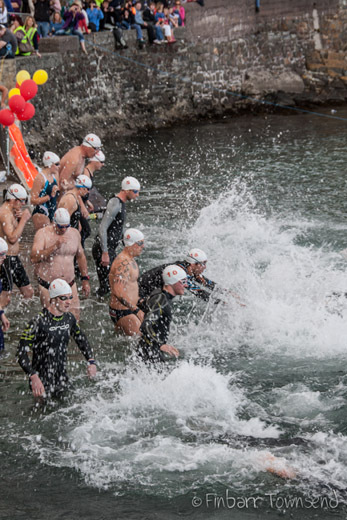 Thanks to Finbarr Townsend, who photographed the swim, and to Donal Buckley, who took photos at the prize giving. We will put up more photos over the next few days. 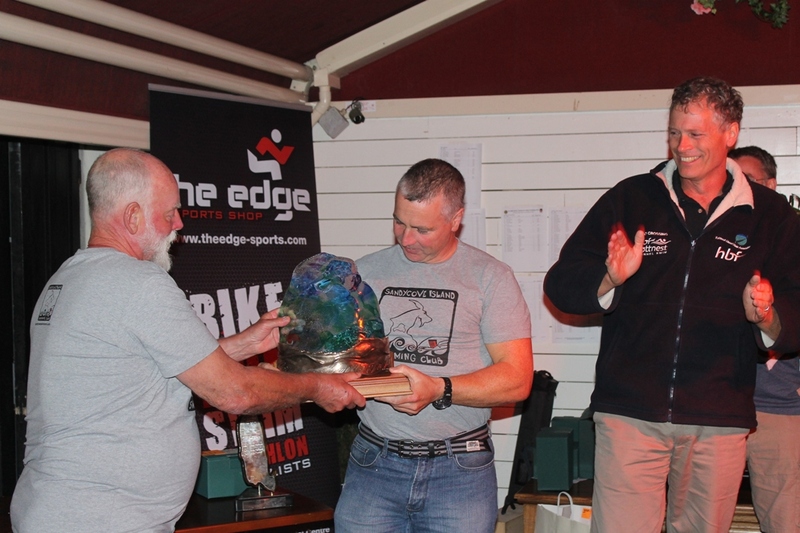 And thanks of course to our sponsor, The Edge Sports, whose support makes the swim possible. Looking forward to seeing everyone again at next year’s swim!